Welcome to the February edition of Ask Dr. Emily! Interventions grounded in applied behavior analysis (ABA) have demonstrated effectiveness across a variety of individuals and behaviors especially within the treatment of autism. Decades of research support that ABA is an effective scientific methodology with an emphasis on teaching skills and reducing challenging behaviors. As ABA can be implemented in many different ways and the field has evolved over the last few decades, there are many types of treatment strategies supported by a large body of knowledge. As such, this can be confusing for parents, autistic individuals and other consumers outside of the field to navigate. This talk will provide an overview of the defining features of the science of ABA, provide an overview of some examples of how it can be applied and discuss quality indicators that can be used to evaluate ABA programs. It will also highlight some of the misconceptions and sources of confusion about ABA, including the origins of these issues as well as the response from the ABA field. This class will be held Thursday, February 21, 2019, at Seattle Children’s Hospital in Wright Auditorium from 7:00 to 8:30 p.m. Please join us in person or watch on Facebook live. For more information see the Autism 200 Series webpage. 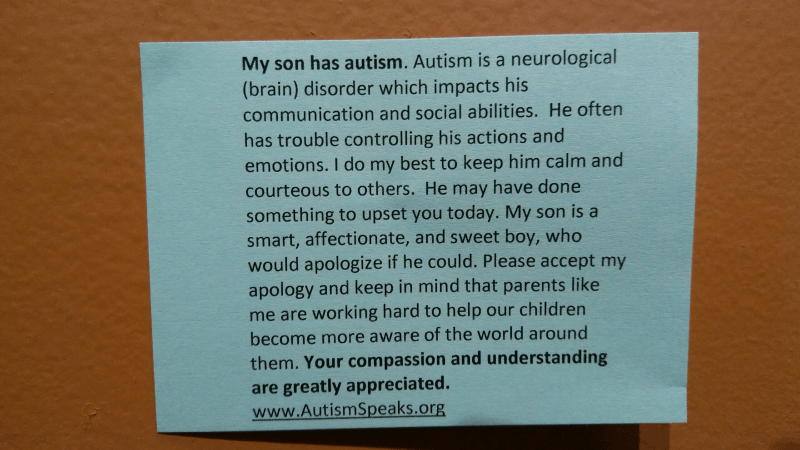 My son Arthur was diagnosed with autism at age two. He is now nineteen. When he was much younger he would often vocalize loudly, perform jazz fingers in front of his eyes, or vigorously sniff everything within a two-foot radius of his nose. On those occasions when Arthur did odd things, I found myself looking at the faces of those around us. I would see their eyes move quickly to me with looks of confusion, anger, even disgust. Fortunately, there was usually a compassionate person who gave me a look of soft kindness and a small nod as if to say, “You got this.” I love those people. In my work with parents of children with ASD and co-occurring challenging behaviors, I often hear the following: “I feel like I am walking on eggshells, worrying that the next thing I do is going to set my child off”; “My child’s behavior feels very unpredictable; when he is set off, it feels like it is coming out of the blue,” and “All those strategies that worked with my other child(ren) don’t seem to work with her.” And parents are correct! Behaviors are learned. This is not to suggest that a parent has set out purposefully to teach their child to hit others, for example, but rather the hitting is the result of the child learning that hitting “works” for them to get a want or need met. For a classic example, consider a child who is yelling in the checkout aisle of the grocery store because he wants some candy on display. His mother may initially say no, but when the child continues to scream, the parent may finally give him the candy. This choice makes sense in the moment because it stops the behavior, the child is now happy and the mother no longer has to manage a tantrum in public. But this might cause problems in the future because the child has ‘learned’ that screaming gets candy. The good news is that if a child has learned to hit others, whine, or tantrum, he can also be taught new, more appropriate ways to behave. Behaviors are forms of communication. Children with ASD often have difficulty with communication — they may find it hard to tell you what is bothering them or may not have a good way to ask for something they want. Even children who are quite verbal can have difficulty “using their words” when they become frustrated or angry. Children with ASD whose communication skills are limited may learn that their behaviors communicate their wishes very effectively. So, when your child is engaging in a problem behavior, an important question to ask yourself is, “What is my child trying to communicate through this behavior?” A tantrum could be saying, “This is too hard.” Screaming could mean, “Leave me alone.” Hitting could be communicating, “That’s mine. Give it back. Behaviors serve a function. A child may act out in order to escape or avoid a situation or demand. For example, a child having learned he will be sent to the principal’s office might hit another student in the classroom in order to “escape” the assignment just given by the teacher. A child also may engage in a problematic behavior to get attention. For example, a child might bang his head as he has learned that this will quickly get his father’s attention when he is talking on the telephone. A child may learn his behavior gets him what he wants. For example, a child may scream loudly when his mother turns the TV off because he has learned that she will turn it back on to stop his screaming during his baby sister’s naptime. Finally, some children engage in behaviors because they are pleasing to the child or are “automatically” rewarding. For example, a child may flap his hands because he finds this pleasant to do when excited. We often consider these behaviors as being motivated by factors such as sensory input, reduction of internal anxiety, or perhaps just being pleasing to the child. When it comes to treating challenging behaviors, the starting point will always be trying to understand the purpose or “function” of the child’s behavior. To illustrate this point, consider a child who is disruptive while doing class work – making paper airplanes, talking loudly to classmates, making noises – and the teacher sends the child to the principal. This child may be disruptive because he is trying to escape from doing class work. While the teacher’s consequence is logical, it will not be effective in reducing the behavior in the future because the child succeeded with escaping from class work. Take the same exact behaviors and teacher response, but this time the function of the child’s behaviors is to get attention from his classmates. In this case, the teacher’s consequence of removing him from the classroom should help to decrease the disruptive behavior because she is targeting the correct function of the behavior – seeking attention. This is why it is so important not to just focus on the behavior when thinking of how to treat problem behavior. It is more useful to target the function of the behavior! Creating a treatment plan is the hard work ahead, figuring out which specific strategies will address the function of the challenging behavior. As you move forward on that journey, keep in mind that any new strategy may take some time to work as your child is learning a new behavior! Consistency, predictability, and follow-through are the keys to success. Your child will learn to accept new rules when he sees you responding the same way every time. To learn more about addressing challenging behavior from Dr. Bearss, check out her Autism 204 talk from last month. It’s OK to be mad, but it’s not OK to hit. This is often the first instruction we tell toddlers as they seek to understand the world of confusing instructions, disappointment, and being told no. My son Arthur hits, kicks, scratches, and pinches people when he’s upset. These are startling words to read and difficult for me to write. Arthur is not a toddler. Arthur is a 17-years-young man. He was diagnosed with autism at the age of two. We’ve had many highs and lows over the years. The highs are amazing – his first 3-word sentence at age 6, fully toilet trained at age 9, noticing him read for pleasure at age 13, and his sheer joy when exploring Google Maps. He loves his family, our friends, his teachers, and his therapists. Arthur brings out the best in everyone. He redefines what it means to be normal. He strives to make sense of his life, just like the rest of us. He is a great guy. Let’s talk about the lows. Aggression, property destruction, and blow-out tantrums are about as low as it gets for us. Everyday experiences can be powerfully overwhelming, frustrating, and confusing for Arthur. Loud sounds, nonsensical rules, and confounding instructions make him feel overloaded. And when that happens he can sometimes lash out with a quick pinch, hit, or kick. I know the triggers and know the signs leading up to it, but I’m his mother, and I know him so well. I can anticipate his actions…most of the time. Unfortunately, not everyone interacting with my son can spot the build-up to his aggression. When Arthur becomes aggressive or destructive, time slows down and my vision tunnels. I scan for items that can be thrown, windows that can be broken, or the direction of the busy street he might bolt toward. I become stronger – ready to deflect, duck, and protect. Sometimes Arthur is so upset that he harms himself so I physically have to protect both of us. If a stranger hit me I’d be scared and furious. But in those moments when Arthur has completely lost his ability to control himself, I feel compassion and deep sadness. It’s difficult beyond words to watch your child become so upset that he harms others, destroys property, and injures himself. The aftermath leaves Arthur and me completely drained. Arthur likes to decompress in his room. That’s when the fear sets in for me. Will this continue into adulthood? What if he hurts someone? What happens if the police are called? Will they know he’s disabled rather than a threat? Will he be hurt? Will this limit his opportunities, freedom, and dignity in life? Impulsivity, emotional control, and inflexibility are hallmark characteristics of autism. They are the main reasons for my son’s challenging behaviors. Fortunately, years of therapy to address challenging behaviors have paid off. We have a much better understanding that behaviors happen for a reason. They are learned, and they can be addressed. We better understand the triggers that set him off, effective strategies to keep him calm, and what works when he experiences a serious meltdown. Behavior is communication. As we’ve come to understand what he is trying to tell us, we are now able to get out of the house more. Like many parents with children who experience aggression, the fear of a meltdown can drive us into isolation, making us reluctant to leave the house, send our child to school, participate in community events, or even go to the grocery store. Aggression, self-harm, property destruction, and other challenging behaviors are some of the most difficult aspects of autism. Fortunately there are Applied Behavior Analysis (ABA) strategies that are effective at addressing challenging behaviors. In the next blog, Karen Bearss PhD, a clinical psychologist at Seattle Children’s Autism Center will focus on parent training to address problem behaviors for individuals with Autism Spectrum Disorder. She explores many of the same strategies that helped us understand and address Arthur’s problem behaviors and best of all, Arthur is happier and possesses a sense of sovereignty. Finding comfort and camaraderie with other parents has helped and this wallet card has also come in handy for me over the years.